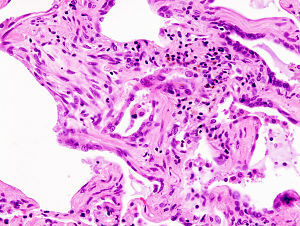 Pulmonary fibrosis, sometimes known as “scarring of the lung”, is the name given to a group of chronic lung diseases. Read on to discover what exactly pulmonary fibrosis is, its symptoms and the treatment options available for this chronic lung disease. There are various different causes of pulmonary fibrosis, you can find out more on our page Causes of Pulmonary Fibrosis. Fibrosis: Fibrosis is the formation of too much connective tissue. Connective tissue supports and connects our internal body components (organs, muscles, nerves etc.) as well as protecting our organs and storing energy. When fibrosis occurs after an injury this is known as scarring. So putting this together, pulmonary fibrosis is the formation of excessive connective tissue in the lungs. 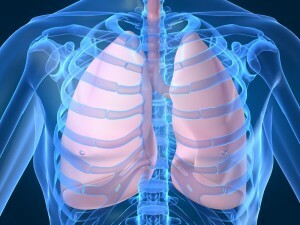 2) Our lungs are normally very elastic, this allows them to expand and contract as we breath in and out. Fibrous tissue is not elastic, therefore pulmonary fibrosis causes lungs to become ‘stiff’. This is why pulmonary fibrosis is known as a restrictive lung disease. 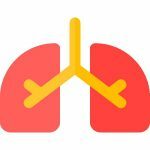 What are the complications of pulmonary fibrosis? Pulmonary fibrosis can lead to a condition known as pulmonary hypertension where there is increased pressure in the blood vessels in the lungs. Sometimes, severe pulmonary hypertension can put extra strain on the heart leading to symptoms of heart failure. Supplemental Oxygen can help prevent the development of pulmonary hypertension (see more treatments for pulmonary fibrosis). Some patients may be at increased risk of a blood clot in the lung – a pulmonary embolism. Anticoagulants (drugs which thin the blood) can be given to help prevent this.